Rocky (Yash) is born in Kolar. His mother dies when he was kid. She tells him a few valuable words. He wants him to become a billionaire. As a kid, he travels to Mumbai to learn tricks of the trade in mafia. He become a big smuggler. He realises about Kolar Gold Field when he visits Bangalore. Rest of the story is all about how he smuggles himself into Kolar Gold Fields and liberates slave workers. Actors: KGF belongs to only one actor - Yash. He has done supremely well. He shines like a star in all the hero elevation scenes and he has terrific screen presence. Srinidhi Shetty doesn't have much of screen space. She is okay. Ananth Nag plays the role of a retired journalist who narrates the story of the film through his book. Most of the actors in the film are from Karnataka and casting is excellent. Story - screenplay - direction: Story of the film is good and connects well with the masses. Director Prasanth Neel’s direction is good. He brings a lot of style and swag to the film with his narration that is rich with visuals and sound. The narrative technique is in classic style where story is narrated in three time-frames. Screenplay of the film is good. Though there are a very few scenes, mother-son sentiment plays a major role in connecting audiences emotionally to the story of the film. Prasantha has terrific visual narrative skills. It’s at par with any world cinema or Hollywood film. Director ends the chapter 1 film with visuals that make us wait eagerly for the chapter 2. Other departments: Cinematography by Bhuvan Gowda is extraordinary and brings stylized rawness to the screen. Background music by Ravi Basrur is amazing. This is one of the best background scores ever scored on the Indian screen. Rerecording is terrific. Production design is perfect. Action sequences are extremely stylish. Dialogues are very effective. The best dialogue in the film is ammani minchina yodhulu prapancham lo leru (there is no greater warrior than a mother). Editing of the film is good. Production values of the film are extravagant and you can see it in each and every frame of the film. Analysis: Director Prasanth Neel stamps his authority as stylised and gritty filmmaker with KGF. First half of the film is flamboyant showing how hero rises through ranks. Second half is gritty and tells how hero fights his way to emancipate slave workers in goldfields. Plus points of the film are Prasanth Neel’s stylized visual narration, heroic elevations, background music and technical brilliance. On the flipside, narration is slow and there is lots of violence in the film. 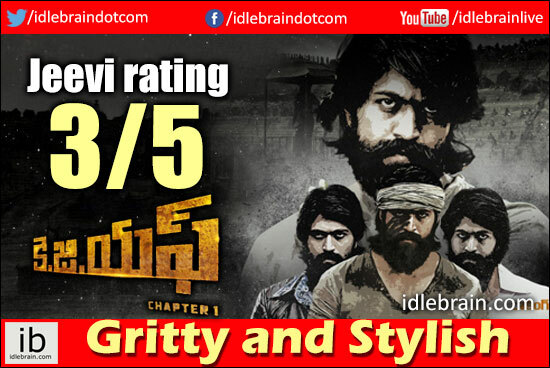 On a whole, KGF is gritty yet stylish film told with universal emotions. You may watch it!